A wonderful way to enjoy natural beauty in the heart of Catalina Island is at one of the hotels on the beach. 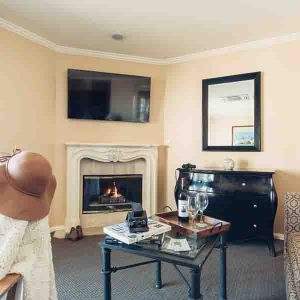 It is fun for couples and the whole family will definitely love Catalina’s finest beachfront hotels. These Catalina Island hotels on the beach provide a luxurious accommodation to all kinds of guests in a variety of rooms and suites. A stay in any of these hotels provides a lifetime memory. Catalina Island has a few hotels in Avalon that are on the beach, but in actuality the closest they can get is across the street. Crescent Avenue runs the length of the half-moon along Avalon Bay (hence the name “Crescent”). However, being just a few steps from the water is a great way to spend a vacation on Catalina Island. There are areas of sand including an actual shoreline right around the Green Pleasure Pier where you can get your feet wet. Our featured choice of Catalina Island hotels on the beach is the Portofino Hotel. This beautiful hotel has a sandy area across the street from it and it’s just a short walk to the pier. Aside from this, the hotel boasts a variety of great features and amenities. The main feature of the Portofino hotel is its fantastic location. It is just steps away from the beach and water and also the heart of Avalon. The whole experience from start to finish is one of elegance and charm. This European style hotel has many unique attributes including flowered courtyards. It is also easy walking distance to just about everything in Avalon. A variety of shops, spas, restaurants and more awaits you as you stroll in this wonderful piece of paradise. A favorite amenity of the hotel is the sundeck which offers excellent views of the bay and surrounding areas. You can check out beach towels and chairs at the front desk and enjoy the relaxation. There is a great harbor view and you can simply relax and enjoy the outdoor atmosphere. Another option is the complimentary beach cruisers the hotel offers. There is nothing like enjoying a bike ride down the beach and exploring the Avalon area. This is another great reason to stay at this Catalina Island hotel on the beach. Enjoy a complimentary continental breakfast served each morning to get your day started in the right direction. You also have the luxury of in-room coffee to help wake you up each morning. The lodging choices at the Portofino Hotel are excellent. All rooms include refrigerators, WIFI, hairdryers, and HD television with cable and movie channels. Many of the suites feature extra-large living areas as well as gas fireplaces to keep you warm on those chilly nights. Private patios and balconies are available in select units and have great views of the ocean. Another great feature of the Portofino Hotel is the types of beds they use. All rooms have a special type of mattress to give you the most in comfort. These special beds are called “Signature Serenity” Memory Foam beds and provide the ultimate in a good night’s rest. One final feature to note is the exclusive vacation rental located about 1.5 miles away in Hamilton Cove. This rental is 2 bedrooms with a kitchen and ocean view patio. It even includes a golf cart for your personal use to get around town. This condo adds a nice touch to an already excellent hotel!